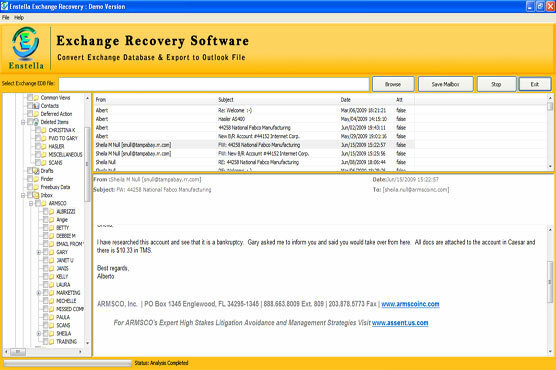 Enstella Exchange EDB to PST conversion freeware software is one of the best uncomplicated software that easily work on damaged EDB file without changing it originality. EDB recovery freeware utility quickly recover emails from EDB file with all emails metadata- to, bcc, cc, date, time and subject etc. Enstella EDB to PST freeware converter software is professional and result oriented application that smoothly converts exchange EDB to PST in a very short duration. Enstella EDB to PST extractor program conveniently extracts data from EDB file and transfer Exchange mailbox to PST mailbox with all respective folders- emails, notes, task, inbox, outbox, sent items etc.